There may come a time when redesigning your kitchen becomes necessary. A lot of activities are carried out in the kitchen, so when you redesign it, see to it that it is an efficient place for carrying out these activities, that it is safe, and that it suits your style. Of course, you have to take certain factors into consideration before deciding on your new kitchen design. Redesigning your kitchen may cost you a considerable amount of money. But, when you allot a budget for it, you will be able to focus on things that need to be updated. Naturally, the extent of the redesign is dependent on the amount of money you are willing to spend. For examples, if your budget is limited, you do not have to replace the entire kitchen. You just have to replace certain items, such as worn-out cupboard doors; there is no need to change the cupboards in their entirety. Having a conceptual plan for your new kitchen helps you with your budget, and you can do that by listing down items, materials, or equipment that would be needed. Decide on a theme for your new kitchen, but make sure that it fits with the other areas of your home. It should not stick out like a sore thumb. The elements in your kitchen, such as the paint, flooring, and lighting fixtures should be in harmony and blend with the rest of the house. Your kitchen floor makes a lot of difference in your kitchen. See to it that it is durable and safe and that it is suitable to the theme of your kitchen. There are different types of flooring, but tiles and floor boards are great options. Lighting provides a certain feel to your kitchen, but more importantly, it helps carrying out activities in the room more efficient. While fluorescent lighting is commonly used in kitchens, LEDs are a better option for kitchen lighting as they generally cost less in terms of energy consumption and last longer. In sum, having a kitchen redesign has to be well-thought-out. It does not take place often and is not necessarily cheap. Certain factors need to be considered, such as the budget, theme, floor, and lighting. This way, your kitchen is anything but efficient, comfortable, safe, and stylish. And, that is what makes this home improvement project worth it. 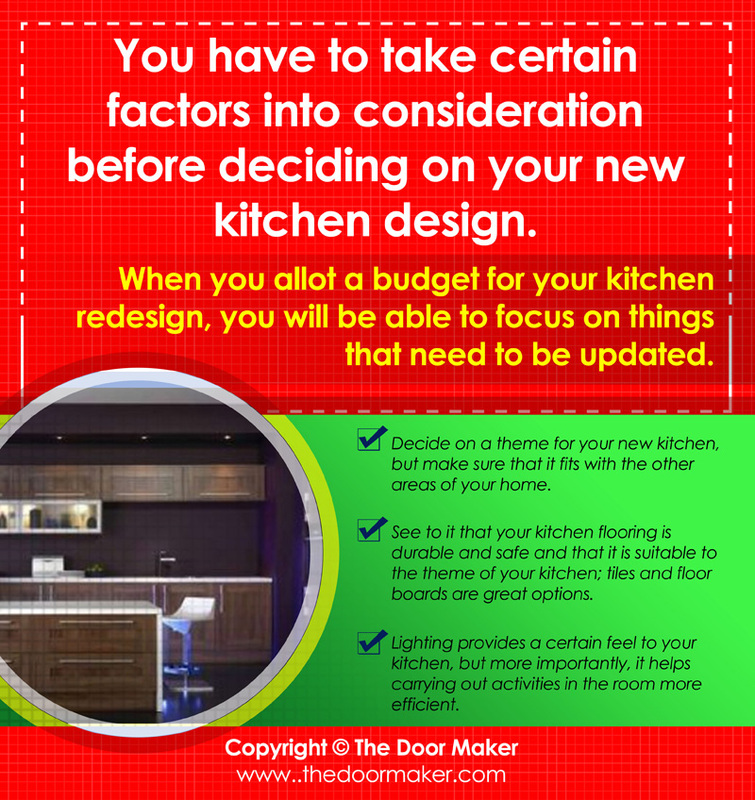 You have to take certain factors into consideration before deciding on your new kitchen design. When you allot a budget for your kitchen redesign, you will be able to focus on things that need to be updated. Decide on a theme for your new kitchen, but make sure that it fits with the other areas of your home. See to it that your kitchen flooring is durable and safe and that it is suitable to the theme of your kitchen; tiles and floor boards are great options. Lighting provides a certain feel to your kitchen, but more importantly, it helps carrying out activities in the room more efficient.